Monday Jan 21st is a holiday for my workplace. I plan to camp out most of the day at our local game store. I will have with me the C&C PHB, CKG, and M&T books, as well as my CK Screens - all purchased from Tyler at GaryCon 2012. I will also have the new Pathfinder Bestiary (cardstock minis) boxed set, standard metal miniatures, a couple of vinyl mats, about 8 different sets of D&D dungeon tiles, no less than 30 different pre-generated 3rd-4th level C&C characters... and The Ruins of UnderMountain campaign setting. The game store owner will be announcing this C&C demo on their Facebook and website, as well as setting up an event page. My goal is to introduce Castles & Crusades to anyone brave or foolish enough to make the descent into Halaster's Halls. I figure this would be the best way to 'drop' prospective C&C players into the game system without wasting too much time. 'Trial by fire' as it were. 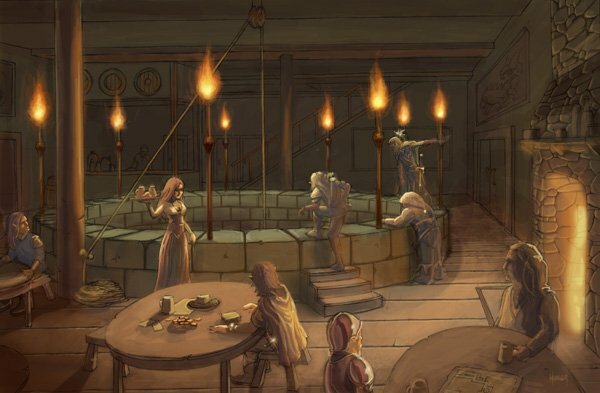 The setting is perfect for this type of round-robin playing, with the near-endless labyrinth of dark halls and chambers, numerous adventuring parties chasing monsters hither and yonder, and the occasional roving teleport trap; not to mention the physical traps to take care of those pesky exiting players. How long has it been since you have seen the light of day? btw, you can read about the exploits of my regular group here. voices, occasionally raised in jest or anger, before sinking back to a quiet hubbub again. jokes to friendly patrons, and occasional slaps to those who try to be too friendly. hemp rope is slung through it, one end descending into the dark void. and kneels beside the dying man. "Lie still" he commands. "The others?" "F-fallen" gasps the injured man. "*cough* The statue - s-spiders - we didn't..."
"Hush" responds the priest. "Tymora smiles on you. Luck is with you this night. Rest now." sighs as color returns to his cheeks, and he sinks into a deep sleep. dour-looking man who has stepped out from behind the bar. "There's your fee, Durnan." calls the priest without looking up as he attempts to remove the man's shredded armor. "Aye." responds Durnan. "See to him. He left a tithing behind the bar before he descended." So, blackmote... how did your demo turn out? had about 7 players throughout the day, peaking at about 5. And everyone seemed to enjoy the simplicity of the system, as well as the method I used to draw them into the game (lost in the maze of UnderMountain). I've had a couple of regular sessions since that time, and I plan to hold another UnderMountain/C&C demo at the store again soon. I am also looking at trying this demo at a few regional conventions this Spring & Summer. Good news blackmote. I hope even just one of your players tries his own adventure with C&C because of their experience. Crusade on! finally gearing up to run more of these demos at the game store (and maybe more than one game store in the area) in between May and June. I'll update soon. That's a nice demo sheet! I've got one that uses the phb cover and logo, but the font for the game and time is nowhere in the ballpark of your's. Thanks Tyler! Just trying to make you guys proud as I attempt to make more roleplaying explorers in my region aware of C&C. so I ended up with 8 players ranging in age from 9 to 52 years old for a couple of hours last night. pretty cool. I'll give a longer recap (with pictures) by this weekend. Just been crazy busy since last night. 8 people?? I needed some of your players recently. Can't wait to hear about it.